West Nile Virus—a potentially deadly infection spread by mosquito bites—is now a permanent resident of Arizona, according to a study by Northern Arizona University and the Translational Genomics Research Institute (TGen), an affiliate of City of Hope. 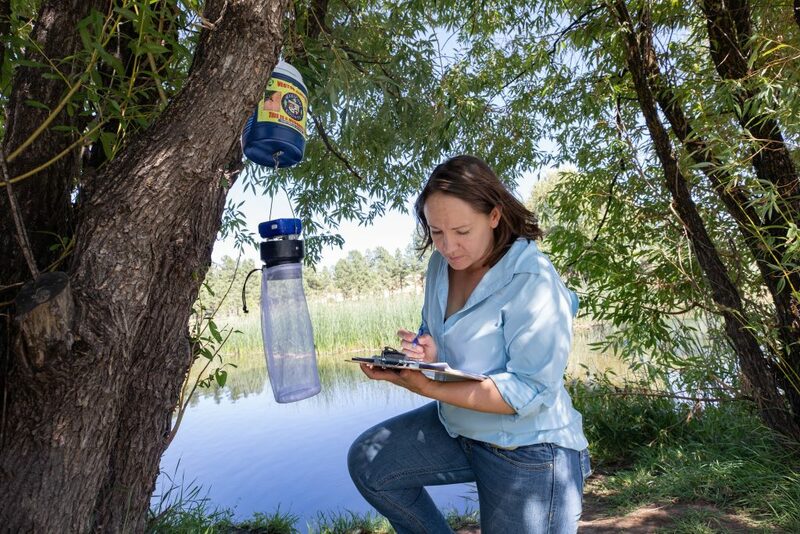 Crystal Hepp, an assistant professor at NAU’s School of Informatics, Computing, and Cyber Systems, is the lead author on the study, which analyzed the genetic material of West Nile Virus (WNV) directly from mosquitos collected in Arizona to build out a genomic family tree of the virus. Researchers then used advanced computer algorithms to develop a theoretical model of how the virus moves around the American Southwest. This first-of-its-kind study, Phylogenetic analysis of West Nile Virus in Maricopa County, Arizona: Evidence for dynamic behavior of strains in two major lineages in the American Southwest, published Nov. 26 in the journal PLOS ONE. Originally isolated in 1937 in the West Nile district of Uganda, Africa, the first Arizona case appeared in 2003, four years after it emerged in the United States, most likely from bird migrations. The NAU-TGen study results suggest Arizona’s moderate temperatures allow the WNV to over-winter in the Grand Canyon State in populations of mosquitoes and birds. As a result, researchers believe Arizona is a likely permanent source of WNV infection that is annually exported by migratory birds to other states. WNV, the leading cause (96 percent) of mosquito-borne disease in the continental United States, was identified in America in New York in 1999. It since has spread to every state but Hawaii, causing more than 1,000 deaths. It usually is active in the summer and fall, dissipating when temperatures reach freezing, something that rarely happens in Maricopa County. Specific WNV strains were identified using a relatively new protocol called whole genome tiled amplicon sequencing. A version of this protocol was first used to sequence the Zika virus. Hepp repurposed the protocol in this study to sequence WNV. There are no vaccines to prevent or medications to treat WNV. Fortunately, most people infected with WNV do not feel sick. According to the U.S. Centers for Disease Control and Prevention, about one in five infected people develop a fever and other symptoms, such as headache and nausea. About one out of 150 infected people develop a serious, sometimes fatal, illness when the disease spreads to the brain. The CDC recommends reducing the risk of WNV by using insect repellent and wearing long-sleeved shirts and long pants to prevent mosquito bites. The Arizona Technology Research and Initiative Fund and the Arizona Biomedical Research Centre provided funding for this study.